(Bloomberg) — Former Zimbabwean Vice President Emmerson Mnangagwa fled the southern African nation because of “incessant threats” against him and his family two days after he was fired by President Robert Mugabe. Mnangagwa, 75, said Wednesday in a statement that he never planned to harm Mugabe, who he’s been supporting for more than four decades, and pledged to work to establish a “new and progressive leadership” in the ruling Zimbabwe African National Union-Patriotic Front. “You and your cohorts will instead leave Zanu-PF by the will of the people and this we will do in the coming few weeks,” he told Mugabe. Mnangagwa fled to neighboring South Africa, according to a person familiar with the situation who declined to be identified because the politician’s whereabouts have not been publicly disclosed. Zanu-PF expelled Mnangagwa, party spokesman Simon Kaya Moyo said after a meeting of the politburo in the capital, Harare. His dismissal marked a dramatic shift in politics in Zimbabwe, where he had been a pillar of a military and security apparatus that helped Mugabe emerge as the nation’s leader after independence from the U.K. in 1980. He was Zimbabwe’s first national security minister. 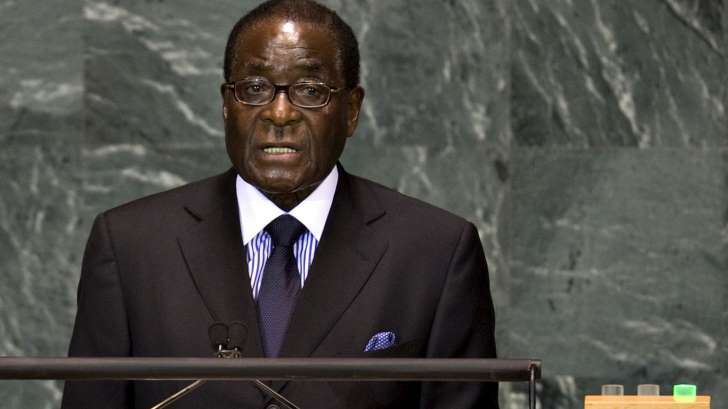 Now Mugabe, 93, has broken with most of his comrades who fought in the liberation war, leaving the so-called Generation 40 faction of younger members of the ruling party championed by his wife, Grace Mugabe, in the ascendancy. The final outcome of the power struggle could be determined by the military and the stance of the 61-year-old commander of the army, Constantine Chiwenga, who traditionally supported Mnangagwa. Mugabe said he fired Mnangagwa because he was plotting against the government. The Zimbabwe National Liberation War Veterans Association condemned Mnangagwa’s dismissal and said it was breaking with the ruling party. The veterans are calling for support from western nations and countries in southern Africa to help maintain peace and ensure free elections in Zimbabwe, a leader of the group, Chris Mutsvanga, told reporters Wednesday in Johannesburg. Mnangagwa’s firing and expulsion from the ruling party came amid growing tensions before elections next year when it may face a seven-party opposition coalition that’s capitalizing on public anger over cash shortages, crumbling infrastructure and a collapse in government services. The economy has halved in size since 2000. Supporters of Grace Mugabe, 52, gathered outside Zanu-PF headquarters on Wednesday with banners calling for her to be named vice president. Mnangagwa’s dismissal came after she accused him of plotting against her husband. She made similar allegations against then Vice President Joice Mujuru, who also fought in the liberation war. Those led to her ouster three years ago. While Mugabe is the party’s candidate for the elections, Grace, the president’s former secretary whom he wed in 1996 after the death of his first wife, said on Sunday that she’s ready to succeed him. Her announcement came as Zanu-PF is planning to amend its constitution at a congress next month to ensure that a woman is appointed to its top body, known as the presidium. It currently comprises the president, Mnangagwa and Zimbabwe’s other vice president, Phelekezela Mphoko. “We’re experiencing what’s clearly the unraveling of the state under Mugabe and, more significantly, the un-bundling of the securo-state in which Mnangagwa and defense force commander Chiwenga are a part,” said Ibbo Mandaza, head of the Southern African Political Economic Series Trust in Harare.